Escape from the city this summer and explore Southend-On-Sea's unknown beaches. Every year the summer month brings hundreds of tourists to Southend's beaches making it very crowded, but there are some hidden gems not everyone knows about. The beautiful beach at Shoeburyness. Just a fifteen minute drive from the most popular beach on Eastern Esplanade and a five minute train journey from Southend town centre lies Shoeburyness East beach. Shoeburyness train station is just a two minute walk from the beach making it easy and hassle free to find. Tourist can enjoy an award winning sandy beach and a much more pleasurable experience than some of the more popular beaches in Southend. Shoeburyness East beach won its Blue Flag and Quality Coast award for its sandier and less pebbled beachscape; however still remains tranquil during the summer. The beach is surrounded by ten acres of open space and greenery which makes it the perfect spot for ball games, picnics and watersports. East beach is also home to the Essex Kite Surfing Club; of which their members are extremely entertaining to watch whilst you sunbathe and relax. On the other hand, if you are feeling adventurous - you can even have a go at Kite Surfing or another type of watersport yourself. 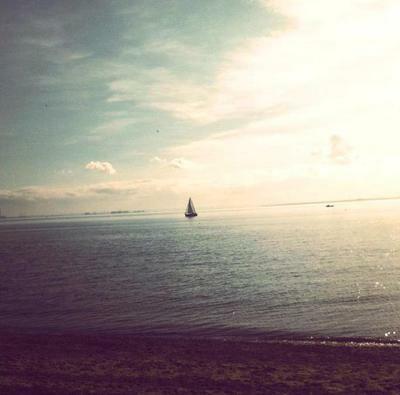 Sail boat at Shoeburyness East beach. Picnic tables overlooking the sea. Newly developed at the beginning of the year with a £350,000 revamp, visitors are now free to use BBQ pits located in the centre of the greenery that makes a day at the beach even more memorable. All you'll need to bring with you is your food, coal and a grill to cook on. The BBQ pits are surrounded by picnic tables so you can eat whilst looking out to sea. 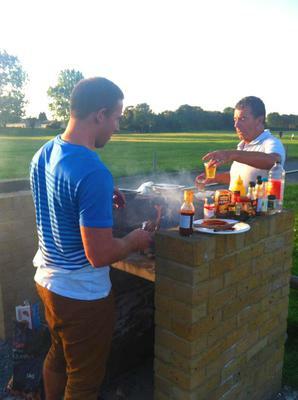 Night time BBQs are also a great idea and gates shut at 9.30pm. There is a small café located by the beach for food; however food here can be quite expensive. Food and drink is therefore cheaper to purchase at either one of the chip shops, cafes or corner shops located by the train station in Shoeburyness High Street. The newly built BBQ pits. A perfect spot for a BBQ or picnic. If you are having a family day out, there is a shallow pool created from the sea which provides safety and a chance to swim even if the tide is out. This is the only tide washed paddling pool in the area; making it the only place to swim in the sea if the tide is out on your visit. On the other hand, if swimming isn't for you then the pool is also excellent for crab fishing with the kids. Fishing nets and other beach essentials can be purchased at one of the local shops located in Shoeburyness High Street. The kids will also enjoy the newly built playground on the grass verge between the beach and the greenery. The newly built childrens playground. In 2012 a walkway was also opened from Shoeburyness East beach which enables you to walk along the whole of Southend-On-Sea's coastline. Starting from Shoeburyness East beach you can walk or take the cycling path through the Garrison and along the long and stretching coastline. Directly next to the beach is Shoeburyness Garrison, which is worth a visit whilst at East Beach. Its history dates back to 1797 and has many military historical buildings that are protected by the English Heritage as ancient monuments. The historic clocktower at the Garrison. Overall, Shoeburyness East beach is an all-rounder with its sandy and clean beaches, and its choice of activities for everyone in the family together with helpful facilities. Parking by the beach is no longer free on site, but there is plenty of free parking outside the entrance. The Garrison also makes a visit to Shoeburyrness East beach more memorable with its history and beautiful settings. Why? Beautiful, tranquil and so much fun. Beautiful, clean beach, dunes and large field for ball games and picnic. Great place for dogs as they are allowed on the beach from October to April.